Military officials said 25 heavily armed parachutists who landed in a cornfield on the grounds of a Colorado prison last week were on a training mission but some 3 miles off target. "Those were Special Operations Command forces conducting routine training," Army Col. Hans Bush, a spokesman for the command at MacDill Air Force Base, Fla., said Monday. He declined to identify the units that landed at Fremont Correctional Facility but said the target was Fremont County Airport. The special operations troops, which could include Navy Seals or Green Berets, began dropping from the sky at about 4:50 a.m. Thursday. Guards on duty, who are trained to watch the skies following a helicopter escape in 1989 from a prison near Ordway, Colo., held their fire after noticing the parachutists were soldiers. Guards who stopped the men and asked for identification were presented with documents that identified them only as Defense Department employees, Colorado Department of Corrections spokeswoman Katherine Sanguinetti. "We don't know who they were and I'm not sure we'll ever know who they were," she said. "Everyone acted appropriately." 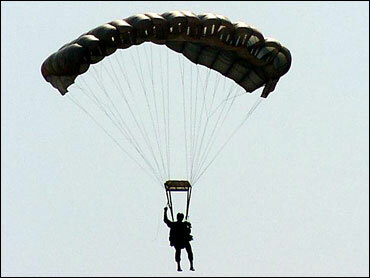 The parachute troops were armed only with rubber training bullets and would have been outgunned if shooting erupted. "The good news is everyone was able to quickly assess the situation," Bush said. "We train and practice here in the U.S. so we can work through things like this," Bush said. The Fremont Correctional Facility is a mixed custody facility that houses inmates classified from minimum to administrative segregation. It houses 1,471 inmates and employs about 450 people.